A stroke occurs when the blood supply to a portion of your brain is reduced or interrupted. During a stroke, brain cells begin to die. As a result, you may develop paralysis on one side of your body, pain, memory loss, trouble understanding, difficulty talking or swallowing, and changes in behavior. Recovery from a stroke is a long process. The main goal of rehabilitation is for you to regain independence, increase your strength and relearn basic skills such as handwriting. Regain control of your hands and fingers. Place coins on a table and pick them up one at a time. Place the coins on the other side of the table so that you have to reach for them. Squeeze a stress ball in the hand you will be writing with. This helps to regain your griping ability. Place a rubber band around the fingers of your affected hand, with your fingers close together. Spread your fingers out as far as possible, then bring them back together. Repeat multiple times. This helps to increase the movement in your fingers. Start writing. 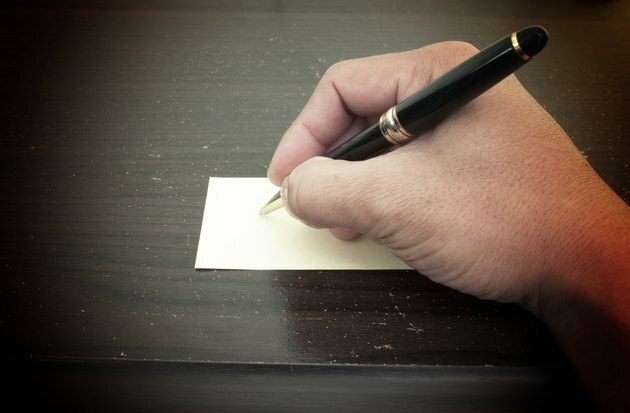 Pick up a pen and a sheet of paper and focus on writing your name or small words accurately. An occupational therapist may provide you with the dotted line paper used by children who are learning to write in order to emphasize accuracy as you learn to write again. Learning to write again may be one of the furthest things from your mind as you recover from a stroke. However, learning how to write can help to tune your fine motor skills and provide you with a means of communication if you are having difficulty talking. Attend occupational therapy. Occupational therapists are trained to help you improve your fine motor skills, including reteaching basic tasks such as talking, dressing, walking, eating and writing. What Are the Symptoms of Stroke Confusion?